Virtual Reality is rapidly being viewed as an effective business tool to present and educate configurable products at trade shows. 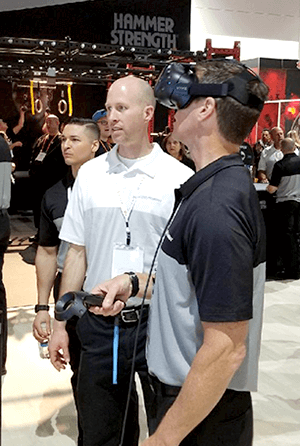 Manufacturers are adopting VR technology and using it as a focal point in their booth presentation. It's a unique way to showcase a product, demonstrate benefits, and leave a memorable impression. Axonom customers in the medical, fitness, apparel, and data center industries are leveraging virtual reality to augment their visual product configurator investment. Virtual Reality provides an immersive experience for decision-makers to validate the design. It gives them a first-person point of view to visualize the environment, explore how products fit in the footprint, and determine if spacing affects workflow. Six Axonom customers have used virtual reality to showcase their products at trade shows this year. Axonom attended each show to not only support the customer but to also observe the attendee's reaction to the VR experience. 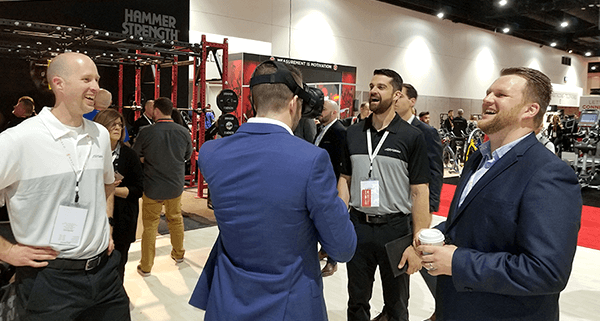 Using the HTC Vive, Life Fitness provided IHRSA attendees with an immersive experience to visualize and explore Hammer Strength brand equipment in a preconfigured training facility. The virtual reality exhibit generated a lot of buzz in the booth. Life Fitness found IHRSA attendees enjoyed experiencing Hammer Strength rigs, racks and accessory storage products in a fun, but realistic fashion. Life Fitness will be taking this rig and rack configurator demo video to the FIBO Global Fitness Conference in Cologne, Germany. Read this press release about Life Fitness at IHRSA 2018. BFW Inc. used virtual reality to offer medical professionals a new way to experience its lighting and video imaging equipment inside a furnished operating room. AORN attendees were provided an Oculus Rift headset to view its Pharos Camera System and Headlight Systems, and used hand controllers to move medical equipment and navigate the room. In addtion to virtual reality, BFW Inc. is working with Axonom on a visual quoting and ordering solution. The 2D configurator features real-time pricing, 2D renderings of its surgical lighting products, and interactive drag-and-drop technology. 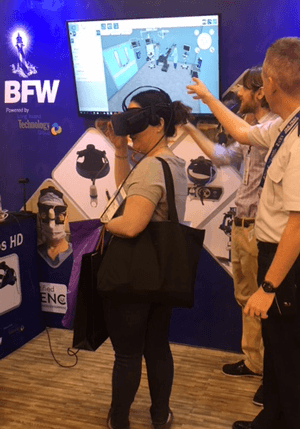 Read this press release to discover more about BFW Inc.'s virtual reality exhibit at AORN 2018. Virtual Reality is very cool and worked extremely well as a WOW factory in our trade show booth. It's great tool to make booth visits memorable, and we hope to use it to alleviate confusion when ordering complex configurations of mobile carts. - Spencer Costello at BFW Inc.
Products Showcased: Surgical Booms and Lights, Tables, Storage Cabinets, Etc. At previous shows, Skytron used the tethered-based HTC Vive as its VR hardware of choice. This year at ACE Summit and AORN, the company turned to mobile, smartphone VR-based headset - Google Cardboard. 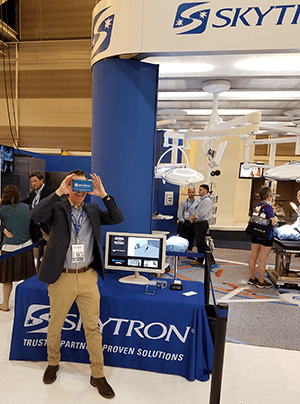 Mobile VR enables attendees to experience Skytron products while they're in the booth or at a later time off-site. In addition to virtual reality, Skytron provides its distributors with a visual product configuration, quoting and ordering solution. Together, 3D CPQ and VR help the customer make better, more informed decisions prior to construction and installation. Read this press release to discover more about Skytron virtual reality exhibit at ACE Summit. Flex, a sketch-to-scale™ solutions company, placed a virtual reality exhibit in its booth at CES. Flex provided attendees with HTC Vive Pro headsets to experience a cylindrical enclosure system in virtual reality. 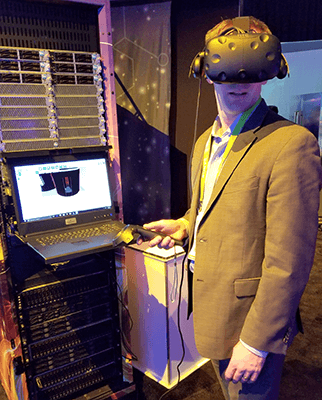 CES attendees immersed themselves into a virtual data center environment to experience the benefits of a vapor chamber versus a traditional data center design. Read more about Flex's VR Exhibit at CES 2018. 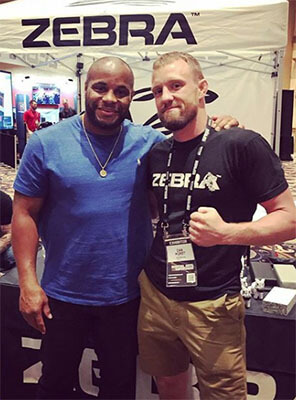 Zebra Athletics unveiled a VR exhibit featuring three personal training centers used by UFC fighters at the Martial Arts SuperShow in Las Vegas. Zebra selected the tethered-based HTC Vive Pro to showcase its products inside a virtual, real-world facilities. Coming soon, Zebra plans to use Powertrak 3D Configurator for gym owners to design their training centers by placing Zebra products (mats, flooring, racks, bags, and cages) in the room. Together, 3D CPQ and VR will help them make better, more informed decisions prior to construction and installation. See UFC fighter Daniel Cormier's reaction to exploring his personal training facility in virtual reality. 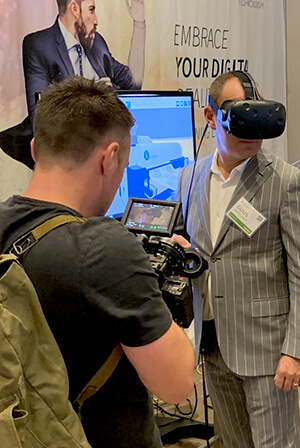 Gerber Technology unveiled a VR exhibit showcasing its digitally-connected, apparel micro-factory at the ideation 2018 conference in Miami Beach, Florida. Gerber Technology selected the professional-grade VR headset HTC Vive Pro for attendees to visualize and explore the micro-factory environment. The exhibit combines virtual reality with 3D animation to show how fabric is passed from system-to-system. Attendees get a first-person viewpoint how fabric is digitally printed, dried, cut, and sewn into a complete product. Read more about the Gerber Technology VR Exhibit at ideation 2018.